On Monday, Alan Greenspan, the former Chairman of the Federal Reserve from 1987 to 2006, dropped a bombshell that will both incite panic as well make people scratch their heads in disbelief. Speaking on Bloomberg in an extensive 30-minute interview, Greenspan gave his assessment of Brexit. The former fed chair said David Cameron made a “terrible mistake” by even holding the referendum. Greenspan went on to explain that Brexit will inevitably lead to both Scotland and Northern Ireland declarations of independence as well. “We are in very early days of a crisis which has got a way to go,” asserted Greenspan. Today’s comments come after his already shocking assessment of Brexit on Friday, in which he said this was the worst situation he’s ever seen. As if Greenspan’s predictions weren’t ominous enough, on Monday, he managed to top them. In his appraisal of the situation, Greenspan noted that unsustainable entitlement spending is eventually going to lead to a crisis. The issue is essentially that entitlements are legal issues. They have nothing to do with economics. You reach a certain age or you are ill or something of that nature and you are entitled to certain expenditures out of the budget without any reference to how it’s going to be funded. Where the productivity levels are now, we are lucky to get something even close to two percent annual growth rate. That annual growth rate of two percent is not adequate to finance the existing needs. I don’t know how it’s going to resolve, but there’s going to be a crisis. We are running out of people. In other words, everyone is very pleased at the fact that the employment rate is rising. Well, statistics tell us that we need more and more people to produce less and less. That is not a prescription for a viable political system. And so what we have at this stage is stagnation. I don’t think that there is anything out there which suggests that there is a recession, but I don’t know that. What I do know is that the money supply, and too, which has always been a critical indicator of inflation, is for the first time going up remarkably steadily 6 percent, 7 percent, almost a straight line. It’s tilted up in the last several months. It’s added a percentage point or two. The thing that we should be worrying about now, which we have actually given no thought to whatsoever, is that this type of economic environment ends with inflation. Historically, fiat money has always ended up that way. 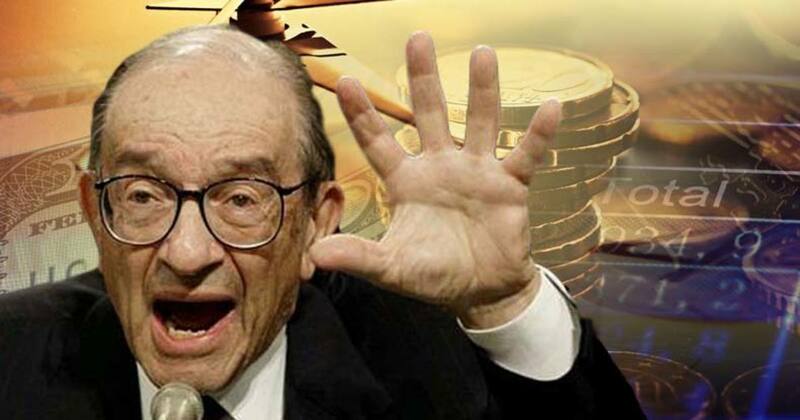 After echoing the eerily similar sentiment of Ron Paul, Greenspan warned of hyperinflation. I know if you look at human history, there are times and times again where we thought that there was no inflation and everything was just going fine. And I just basically say, wait. This is not the way this thing ordinarily comes up. I don’t know. I cannot say I see it on the horizon. In fact, commodity prices are soggy. The oil prices have had a terrific impact on global inflation. It’s not about to emerge quickly, but I would not be surprised to see the next unexpected move to be on the inflation side. You don’t have inflation now. And you don’t have it until it happens. ZeroHedge aptly points out that Greenspan ignores his own role in the creation of the boom-bust cycle which has doomed the world to series of ever more destructive bubbles and ultimately, hyperinflation which will likely be unleashed once the helicopter money inevitably arrives. In retrospect, the 90-year-old, who clearly is looking forward not backward, has a simple solution: the gold standard. If we went back on the gold standard and we adhered to the actual structure of the gold standard as it exited prior to 1913, we’d be fine. Remember that the period 1870 to 1913 was one of the most aggressive periods economically that we’ve had in the United States, and that was a golden period of the gold standard. I’m known as a gold bug and everyone laughs at me, but why do central banks own gold now? Ironically, what Greenspan is referencing in 1913 still plays a devastating role in the current state of global economic affairs today. Immediately after the passage of the Federal Reserve Act of 1913, Congress reassigned the responsibility To coin Money, regulate the Value thereof, and of foreign Coin, and fix the Standard of Weights and Measures, otherwise known as Article 1, Section 8 of the Consitution, to the Federal Reserve. The Fed quickly became a fourth branch of the federal government, only an entirely unaccountable and secret one. The newly created central bank began acting as a single point of controlling authority, setting interest rates for inter-bank lending and regulating the supply of money in circulation — setting of a chain reaction that has led us to the crisis we find ourselves in today.